the wand of Hermes or Mercury; used as a symbol of the medical profession and as the emblem of the Medical Corps of the U.S. Army. Another symbol of medicine is the staff of Aesculapius, which is the official insignia of the American Medical Association. A staff with two oppositely twined serpents and surmounted by two wings; emblem of the U S Army Medical Corps. For veterinary medicine, the double serpent was changed in 1972 to its present form, with a single serpent. See also: staff of Aesculapius. /ca·du·ce·us/ (kah-doo´shus) [L.] the wand of Hermes or Mercury; used as a symbol of the medical profession and as the emblem of the Medical Corps of the U.S. Army. See also staff of Aesculapius. Caduceus. (A), United States Army Medical Corps; (B), American Veterinary Medicine Association. a. A herald's wand or staff, especially in ancient times. b. Greek Mythology A winged staff with two serpents twined around it, carried by Hermes. 2. An insignia modeled on Hermes's staff and used as the symbol of the medical profession. the wand of the god Hermes or Mercury, used as the symbol for the U.S. Army Medical Corps. It is represented as a staff with two serpents coiled around it and is often confused with the staff of Ӕsculapius, a rod with one snake entwined about it. A time-honoured symbol used (incorrectly) by various groups for medicine and the healing arts. The caduceus is a hybrid of the staff of Hermes/Mercury, messenger of the gods, and two serpents in a coital position, representing fertility. 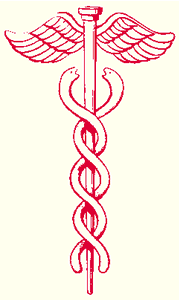 It was originally intended as a symbol of commerce and trade, but in the 16th century, German printer Johannes Froben used it on the cover of a number of medical texts; in the 19th century, possibly through inadequate scholastic diligence, the US Army Medical Corps and US Marine Hospital Service and the Public Health Service adopted the caduceus as the symbol of choice. Medical history The time-honored, yet incorrect, symbol of medicine and art of healing, depicted by two serpents coiled around a winged staff. Cf Æsculapian staff. A staff with two oppositely twined serpents and surmounted by two wings; emblem of the U.S. Army Medical Corps. An emblem or symbol consisting of the winged staff of Mercury around which two serpents are entwined in opposite directions. The caduceus appears on the cap badges of members of the Royal Army Medical Corps (RAMC) and is the emblem of the American Army Medical Corps. The ancient and universal symbol of medicine consisting of the winged staff of Mercury and two intertwining serpents. the wand of Hermes or Mercury consisting of a winged staff with two serpents entwined; used as a symbol of the medical profession and as the emblem of most military Medical Corps. Another symbol of medicine is the staff of Æsculapius, which is the official insignia of the American Medical Association. 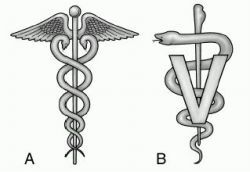 The American Veterinary Medical Association uses a modification of the caduceus as an emblem. The staff is unwinged, there is a single serpent instead of two, and a large V is imprinted over the whole. An adaptation of the caduceus, with only one snake winding itself around the staff is the emblem of the Veterinary Corps of the US Army. I have no doubt in my mind that Caduceus Software, among other EMB and EHR softwares, will completely revolutionize the process of storing and processing sensitive health data in a cost-savings and deliver the information in an accurate manner," says Derrick Gidden president of the Company. ALLSTAR is studying a population similar to the one in CADUCEUS (30-90 days post-MI), but the study included patients that were 91 - 365 days post-MI to see if the indication window could be extended. She holds aloft an olive branch and the caduceus of Mercury, an allusion to trade, with a cornucopia at her feet. Any profits of AAPHP are designated proportionally to the Caduceus Recovery Foundation or the Juris Recovery Foundation, both of which are not-for-profit foundations established to provide treatment assistance for deserving but financially impoverished impaired professionals. The caduceus on my arm identified me to all as a Hospital Corpsman. How is a medical assistant like a Navy SEAL? The Caduceus is actually derived from Asclepius's staff of Greek mythology, which was derived from the Nehushtan, the staff that Moses held up with a snake wrapped around it that healed all the Jews from numerous snake bites (2 Kings 18:4, Numbers 21:4-9). The second piece, featuring the caduceus, the serpents-and-staff symbol of the medical profession for a century, will sit outside the windows of the center's in-house pharmacy. Keenan, a professional musician, also owns the Caduceus wine brand and met Glomski, who owns Page Springs Cellars, when he hired him as a consultant for Caduceus in the early 2000s. The caduceus even threatens such distinctions, undoing the normal hierarchies of structure and decoration: "Not the flowers are for the pole, but the pole is for the flowers. However, Mercury's caduceus, symbolic of peace, is represented on an enamelled fan holder, and festive pendant bunches of emerald and amethyst grapes allude to Bacchus, god of wine and conviviality. Previously, Dr Chang was the chairperson and senior managing director of Caduceus Asia Partners at OrbiMed Advisors LLC, worked in several senior positions at Centocor, a division of Johnson and Johnson, an associate professor at Baylor College of Medicine and was part of the Roche Institute of Molecular Biology.